LAKE SUCCESS, N.Y., August 21, 2012 – Canon U.S.A., Inc., a leader in digital imaging solutions, today announced two new additions to the Canon PowerShot digital camera lineup designed for the on-the-go photographer looking for large extended zoom in compact easy-to-use cameras. For all those times when the action is just out of reach, Canon offers two new super-zoom solutions, the new PowerShot SX500 IS and PowerShot SX160 IS digital cameras featuring an impressive 30x and 16x optical zoom, respectively. Both cameras are equipped with Canon’s latest advancements in auto focus (AF) technology enhancing AF speeds over previous SX-series cameras to capture the excitement in brilliant clarity and quality. The extremely responsive high-speed AF lets you capture great shots as they happen, with significantly reduced lag time. With incredible zoom capabilities, fast responsive AF, stunning resolution and easy-to-use features, both cameras are stylish and compact to take along for any occasion to help you get a good shot from the back of a school theatre or the sidelines of a game. Borrowing from Canon’s optics expertise, these new models include long-reaching zoom and Canon’s Intelligent Image Stabilization technology which analyzes the scene being shot and compensates for camera movement for steady images and video even while panning or walking. In addition to the great optical features, both of these new cameras are also equipped with Canon’s Smart AUTO mode – which will automatically apply optimum image settings for 32 different shooting scenarios. In this mode, the camera automatically identifies the ideal setting, making high-quality images easy for anyone to capture. “In photography, there is no substitution for great optical zoom and while our customers may not always be close to the action, these cameras are designed to help bring their photos and videos in close, with great image resolution and quality as if they were standing right there,” said Yuichi Ishizuka, executive vice president and general manager, Imaging Technologies & Communications Group, Canon U.S.A.
With a 24mm wide angle lens and an incredible 30x optical zoom (up to 720mm) packed into a compact design, the PowerShot SX500 IS enables users to pull subjects in close and capture stunning, high-quality images with a 16.0 megapixel sensor and powerful DIGIC 4 image processer. With such incredible zoom capabilities, the camera is also equipped with Canon’s Intelligent IS system for rock-steady images and HD video even at full-telephoto zoom. A 3.0-inch LCD screen makes operation easy and intuitive, and displays the scene with brilliant clarity. In addition, the camera is equipped with a Zoom Framing Assist feature – a Canon technology that makes zooming-in and framing subjects quick and effortless. This feature is a tremendous benefit for those times when you lose sight of your subject after zooming in. By simply pressing the Zoom Framing Assist button located on the lower front left of the camera, the lens will quickly zoom out to help you re-locate and frame your subject. A frame box appears on the LCD as a guide to place your subject in and releasing the button quickly brings the camera back to the initial “zoomed-in” range. The lens retraction and extension is faster using the Zoom Framing Assist button than the zoom lever, and allows the photographer to keep the camera more stable for the shot, this is particularly helpful for those trying to zoom in and shoot pictures of animals or moving subjects. 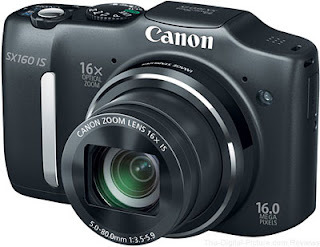 With its compact design and powerful 16x optical zoom, the PowerShot SX160 IS is a versatile camera with a dynamic optical zoom range from 28mm wide up to 448mm, perfect for everyday use. This model also features a 16.0-megapixel sensor, DIGIC 4 image processor and Canon’s Intelligent IS system – providing ultimate functionality in a compact, easy-to-carry design. The camera is always ready to shoot video with its dedicated movie button to start and stop recording HD video instantly and uses the full range of optical zoom when recording, without sacrificing HD resolution. The camera’s large 3.0-inch LCD provides a beautiful display when shooing and recording video or simply scrolling through menu options. Powered by AA batteries, the PowerShot SX160 IS is ideal for easy and convenient shooting on-the-go even when charging a battery may not be an option. 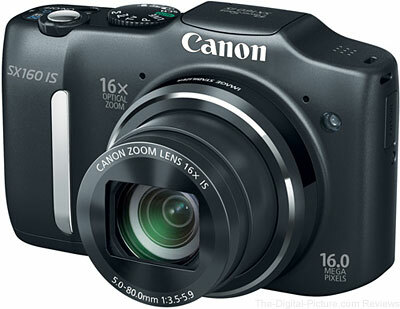 The PowerShot SX160 IS digital camera will be available in red or black. 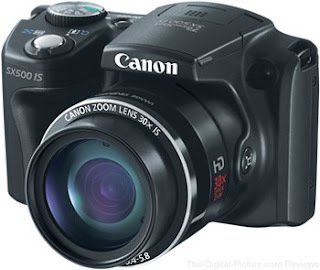 Both the new PowerShot SX500 IS and PowerShot SX160 IS digital cameras are expected to be available in September 2012 for an estimated retail price of $329.99, and $229.99, respectively.